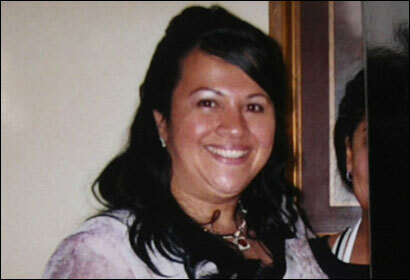 Milena Delvalle, shown here in a 2005 photo, was killed when a section of the Mass. Pike tunnel collapsed on her while she was riding in a car. Governor Mitt Romney this afternoon moved to remove Matthew J. Amorello as chairman of the Massachusetts Turnpike Authority after a tunnel ceiling partially collapsed Monday night, killing a woman in a passing car. Attorney General Thomas F. Reilly echoed the call for Amorello to leave as he launched a criminal probe into the incident, announcing that he was seeking a negligent manslaughter charge. On Monday, several 40-by-20-foot concrete slabs fell at about 11 p.m. when a metal tie back gave way, killing Milena Delvalle, 38, of Jamaica Plain, police said. Her husband Angel Delvalle, 46, managed to crawl out of the crumpled car and was treated at Massachusetts General Hospital for minor injuries and released around 4 a.m.
People should not have to drive through the turnpike with their fingers crossed, Romney said at 2 p.m. press conference, turning his focus to Amorello. "He is secretive and resists oversight of his own board,'' Romney said, adding that the chairman has acted "contrary to the interests'' of taxpayers, bondholders and motorists. Reilly held his own press conference to announce the criminal investigation. Everything is on the table, Reilly said. I'm talking about the Turnpike Authority. I'm talking about anyone that's signed off on this project." Reilly also urged Amorello to step down. Amorello held his ground, meeting with reporters just before 5 p.m. Earlier in the day, Amorello pledged to help with any and all investigations, adding that US Attorney Michael J. Sullivan and the Suffolk Country District Attorneys office are also involved. Transportation officials are removing the three-ton tiles in a 200-foot stretch of tunnel connecting Interstate 93 to the Ted Williams Tunnel. Amorello said that officials found 20 more areas in the tunnel that drew their attention but did not warrant immediate action. Officials do not expect more tunnel closures, but Amorello said they would take whatever steps are necessary to ensure public safety. The metal tie that failed was anchored in the concrete ceiling with epoxy, but not affixed to a metal support rail, as was done with ceiling panels in other tunnels, including those on Interstate 93 and other sections of I-90, Amorello said. Certain site locations prevented builders from using the support bar, Amorello said, without going into specifics. The section of the tunnel that collapsed opened in January 2003 and was in the process of being inspected, Amorello said. The tunnels are checked once every three years, Amorello said. Officials are focusing on the eastern end of the I-90 tunnel connector, but also examined the Ted Williams Tunnel as a precaution because it has ties similar to the one that failed, Amorello said. The ceiling panels that fell help facilitate airflow in the tunnel, Amorello said, and are found almost exclusively in the connector tunnel off Interstate 93. Last night, Delvalle and her husband were driving to Logan International Airport to pick up a relative when at least 12 tons of debris crushed the couples Honda. The impact killed Delvalle instantly, said her relative, Iobel Navarro. Delvalles husband suffered only minor injuries and tried to pull his wife out of the car, unaware that she was already dead, Navarro said. "She was sweet, humble" said Navarro, 30. "I don't have enough words to describe all of her great qualities." The couple married two years ago after meeting in Jamaica Plain, Navarro said. Angel Delvalle worked in the meat department at Hi-Lo foods. His wife balanced a morning newspaper route delivering El Planeta, a Spanish-language weekly, and a day job at a restaurant, her friends and neighbors said. Milena Delvalle had come from Costa Rica to work and send money back to her three children. Her plan, Navarro said, was to raise enough money so her 23-year-old could open a business back home. Before Romney called for the chairmans resignation, the governor and Lt. Gov. Kerry Healey toured the site with Amorello, donning hard hats and florescent orange vests as workers pointed at the debris. Romney and Amorello stood side-by-side inspecting the damage. Workers hope to have the tunnel at least partially open to traffic by Wednesday at noon. The accident snarled traffic throughout Boston and complicated the evening commute. The episode was the latest in a series of problems for tunnels involved in the $14.6 billion Big Dig project. In April 2005, one day after federal officials declared the Big Dig's tunnels safe, rocks and other debris rained down from an overhead vent in the I-93 southbound tunnel in downtown Boston and damaged at least five vehicles, including an ambulance transporting a patient. The debris, which witnesses described as ranging from pebbles to rocks smaller than a golf ball, fell near the Purchase Street exit. It was not clear this morning whether the latest ceiling collapse was related to water leaks that have plagued the tunnels. In March 2005, Big Dig officials launched a survey of the roadway after a chunk of the material fell onto the I-93 breakdown lane. They reported then that water leaks in the Big Dig had damaged fireproofing material in at least 40 areas along the tunnel's ceiling. Most of the damaged areas, which typically measure about 2 square feet, were located near where the tunnel walls meet the roof. Big Dig officials stressed then that the tunnel was safe. In May, prosecutors charged six current and former employees of a concrete supplier with fraud for allegedly concealing that some concrete delivered to the Big Dig was not freshly mixed. State and federal officials said that long-term maintenance, not immediate safety, was the likely impact. Raja Mishra of the Globe staff contributed to this report.